On May 8th, Syria’s Government bannered, “6th batch of terrorists leave southern Damascus for northern Syria” and reported that “During the past five days, 218 buses carrying … terrorists with their families exited from the three towns to Jarablos and Idleb under the supervision of the Syrian Arab Red Crescent.” Jarablos (or “Jarabulus”) is a town or “District” in the Aleppo Governate; and Idleb (or “Idlib”) is the capital District in the adjoining Governate of Idlib, which Governate is immediately to the west of Aleppo Governate; and both Jarabulus and Idlib border on Turkey to the north. Those two towns in Syria’s far northwest are where captured jihadists are now being sent. The Government is doing that because at this final stage in the 7-year-long war, it wants civilian deaths and additional destruction of buildings to be kept to a minimum, and so is offering jihadists the option of surviving instead of being forced to fight to the death (which would then require Syria’s Government to destroy the entire area that’s occupied by the terrorists); this way, these final clean-up operations against the terrorists won’t necessarily require bombing whole neighborhoods — surrenders thus become likelier, so as to end the war as soon as possible, and to keep destruction and civilian casualties at a minimum. Thousands of conquered jihadists (or “terrorists”) that the U.S. and its allies had been arming and assisting to overthrow and replace Syria’s elected Government, are surrendering in large numbers now, and are being loaded by Syria’s army onto buses and sent northward, mainly to the town of Jarabulus (such as the instances here and here and here and here and here and here) — that being one of the few towns where opposition to Syria’s elected President, Bashar al-Assad, has been favored by a majority of the population, and where Al Qaeda (which in Syria is called al-Nusra and other names) and ISIS (which also is called by additional names) have been more popular than Syria’s secular elected President, Assad. The entire Governate of Idlib is the most pro-jihadist Governate in all of Syria. 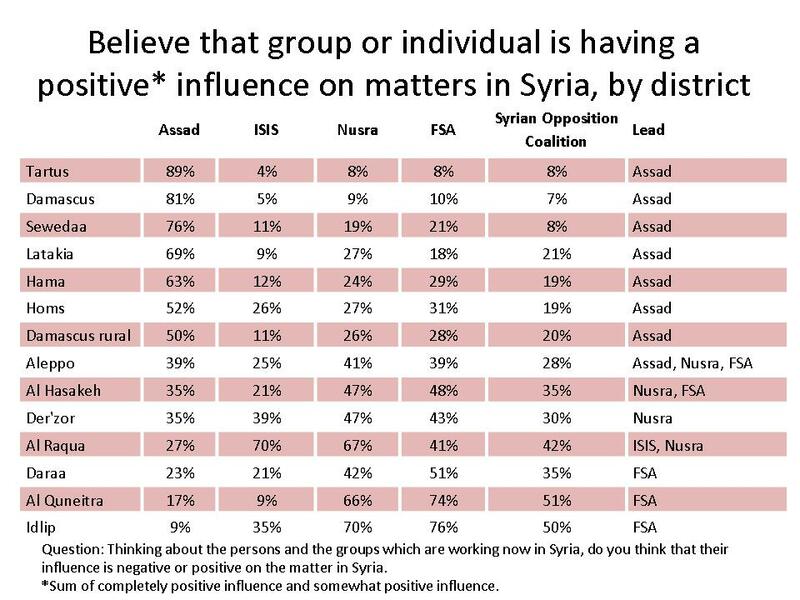 As can be seen there, only 9% of people polled in Idlib (“Idlip”) favored Assad, while 70% of them favored Nusra (Al Qaeda in Syria). After two years of civil war, support for the regime of Syrian President Bashar Assad was said to have sharply increased. 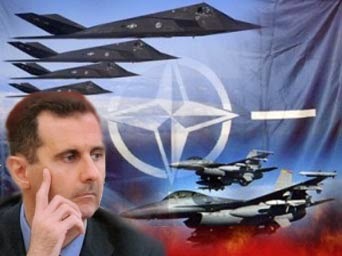 NATO has been studying data that told of a sharp rise in support for Assad. The data, compiled by Western-sponsored activists and organizations, showed that a majority of Syrians were alarmed by the Al Qaida takeover of the Sunni revolt and preferred to return to Assad, Middle East Newsline reported. The data, relayed to NATO over the last month, asserted that 70 percent of Syrians support the Assad regime. Another 20 percent were deemed neutral and the remaining 10 percent expressed support for the rebels. The sources said no formal polling was taken in Syria, racked by two years of civil war in which 90,000 people were reported killed. They said the data came from a range of activists and independent organizations that were working in Syria, particularly in relief efforts. The data was relayed to NATO as the Western alliance has been divided over whether to intervene in Syria. Britain and France were said to have been preparing to send weapons to the rebels while the United States was focusing on protecting Syria’s southern neighbor Jordan. A report to NATO said Syrians have undergone a change of heart over the last six months. The change was seen most in the majority Sunni community, which was long thought to have supported the revolt. And, if this is the way that Sunnis felt about Assad, and about his opposition the ‘rebels’ (that the U.S. supported), then obviously Shia (including Alawite) Syrians were even more supportive of him, and so too were Christian Syrians. So, this British polling firm became commissioned to obtain more-reliable figures, and those figures confirmed the earlier estimates. Then, on the night of April 13th, the U.S. and some allies launched a missile-invasion against Syria based on charging Syria’s Government as having been the alleged source of the alleged chemical attack that had allegedly occurred in Douma. Now that the U.S. alliance has failed to conquer Syria, the U.S. is trying to break off the northern third of the country, and is trying to include, in that U.S.-allied area, as much of Syria’s oil-producing region, around Deir Ezzor, as possible, so as to steal from Syrians as much of Syria’s oil as possible — oil that until recently was being stolen instead by ISIS. None of the news-reports indicate why Jarabulus and Idlib were chosen by Syria’s Government, as the places in which to concentrate the jihadists; but, presumably, a sympathetic population exists there, to receive them. Perhaps, since they’re on the border with Turkey — which, like the U.S., has been trying to overthrow Assad — Syria’s Government is also hoping to make the jihadists become Turkish Prime Minister Tayyip Erdogan’s problem to deal with, and not only Syrian President Bashar al-Assad’s problem. Maybe doing that would reduce some of Erdogan’s ardor for regime-change in Syria. Most of Syria’s ‘rebels’ are not Syrians, but instead are jihadists from around the world, fundamentalist Sunnis who have been recruited, with funding provided mainly by the Sauds who own Saudi Arabia, and by the Thanis who own Qatar, and by the six royal families who own UAE. All of these royal families are themselves fundamentalist Sunnis, and virtually all jihadists except the ones that attack Israel are Sunnis. America’s Presidents lie about “radical Islamic terrorism” by saying that Shiite Iran is the “top state-sponsor of terrorism,” and even that Iran caused 9/11; but none of that is at all true. Israel gets attacked both by Sunni terrorists and by Shiite terrorists — and Shiite terrorism is exclusively against Israel. By contrast, Sunni terrorism is against U.S., EU, Japan, and virtually every non-Islamic country. Israel is allied with the Sauds, who hate Shiites and have hated them since 1744. And U.S.-allied ‘news’media hide all of these essential facts, from their respective publics, so as to redirect The West’s anti-terrorist anger against Iran as the villain, and away from the Sauds and their friends as the villains. This lie protects the fundamentalist Sunni Governments of Saudi Arabia, UAE, and America’s other Middle Eastern allies — the very countries that are behind the Islamic terrorism that plagues the U.S. and Europe. Syria is instead allied with Iran — not with the Sauds, who are Iran’s sworn enemies. The U.S. Government is allied with Sunni terrorists now, just as it was in 1979 when it worked with the Sauds to create Al Qaeda in Afghanistan. Our study of 48 rebel factions in Syria revealed that 33 per cent – nearly 100,000 fighters – have the same ideological objectives as ISIS. If you take into account Islamist groups (those who want a state governed by their interpretation of Islamic law), this figure jumps to 60 per cent. Despite the conflicting ideologies of the rebel groups, 90 per cent of the groups studied hold the defeat of Assad’s regime as a principal objective. 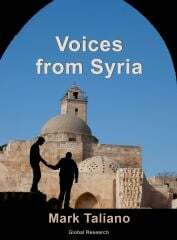 Sixty-eight per cent seek the establishment of Islamic law in Syria. In contrast, only 38 per cent have the defeat of ISIS as a stated goal. Nonetheless, they insisted on overthrowing Bashar al-Assad, based on the incredible claim: “Unless Assad goes, the Syrian war will go on and spread further.” They obviously think that the public — the readers of their report — are extremely stupid. Furthermore, their report ignored that all of these terrorist groups are fundamentalist-Sunni, and that all of the non-ISIS groups are led by Nusra — Syria’s Al Qaeda. The intent there to deceive is clear, but their report that “nearly 100,000 fighters have the same ideological objectives as ISIS” (which likewise is a fundamentalist-Sunni group) was probably true. If the devil incarnate ruled the U.S. and its allies, then how would they be any different from this? What does “evil” even mean? Syria is trying to rid itself of jihadists, but the U.S. and its allies rely upon the jihadists as the U.S. alliance’s proxy-forces or “boots on the ground” to attain their goal of stealing Syria’s oil and so forth. That’s bad, but The West’s hypocrisy about these matters makes its evil even worse than that, like evil-squared — evil compounded by lies about itself.